DescriptionNeed an ultra-light, ultra-compact portacot for few days? Find out more about our Phil & Teds travel portable cot. - Fits in tight spaces like a full car trunk or airline luggage locker. For children from birth till 3 year old. Delivered with a matress protection and a cotton fitted sheet. You're travelling to France with baby? You plan to stop for few days in Paris and then drive to Normandie or to Perigord? Rent this ultra light, ultra compact travel portacot. We deliver to your address in Paris, you'll then to assured that baby will have a secured, easy to use crib during all your stay in Paris. Packed in its bag, this cot is so easy to add to your rented car trunk or carry it by train. 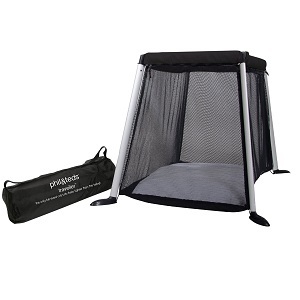 With its mesh sides and zip and its air matress, we really appreciate its different use: safe cot anywhere and playpen. So that our rented cots stay clean for all, we deliver all of them with a matress protector and a cotton fitted sheet. We also have sleeping bags available. "As parents of multiples on our first trip to Europe with our girls, Camille provided outstanding customer service and timely delivery of the cots we needed during out stay in Paris. We'll definitely use her service on our next trip!" Renting our baby cot from baby'tems was a breeze! I appreciated the flexibility in delivery and pickup and the quality of the cot was wonderful. It was packed well and I appreciated the included instruction booklet and the clean sheet and mattress pad. It was a huge relief not to bring our own cot to France. I would absolutely recommend baby'tems to anyone traveling to France!